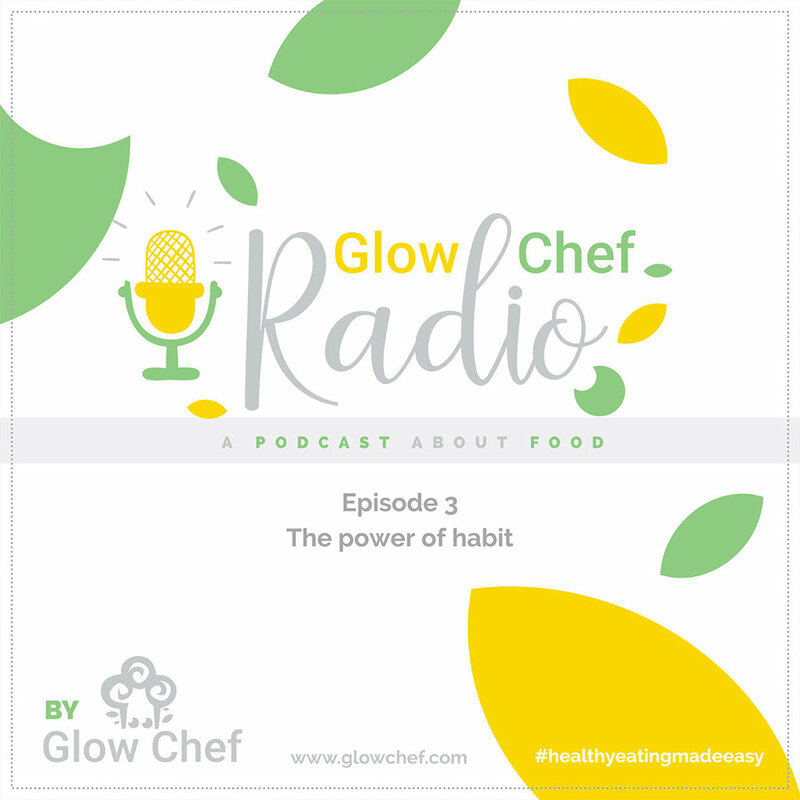 This episode of Glow Chef Radio focuses on habits and their role in determining what we eat in a day. The main takeaway for you is that you can decide how and what you eat and you can introduce new eating habits to achieve your goals. I have news for you: the truth is most of the time we eat what is available to us the moment we feel hungry. Whether breakfast at the corner cafe on the way to work, lunch at the office cafeteria, snacks at our desk… even dinner at home. Therefore, availability is one large determinant of our meals – if lucky, we get to choose from a very limited set of options. And, I actually believe that we trick ourselves into thinking we are making these choices as a way of coping with the demands of daily life, as escapism. 40% of daily decisions are a product of habit! I read recently – unfortunately, I can’t remember where – that over 40% of the decisions we make in a day are not decisions at all; they are just the product of habit. If this is true then what we think is our free will is actually just routine. Note: I remembered! I got this stat right here. So, why is this relevant for healthy eating? On the one hand, by eating this way we are harming ourselves mindlessly, giving the lack of nutritional quality of the food available at most of these outlets. However, on the other hand, this is good news! It means that if we take the time to think and decide how and what we want to eat, then we’ll be able to change our habits and manipulate the availability of the type of food we want to eat. And, therefore we’ll be able to achieve our goals. implement the tools I’m sharing, to achieve change once and for all! You can also subscribe to the show on Apple Podcasts or Spotify. I want to help you do this on your own, therefore I’ve created a roadmap for identifying your needs and planning your new healthy eating habits. So, get your copy and use this roadmap to start changing your diet in a way that’s realistic, practical and empowering. You know you can always come to me with questions, I’m happy to help. Write yours in the comments below. Let me know how you’re doing! I'm Sílvia, creator of the Glow Chef. For me, eating daily should be healthy and easy. Healthy eating is not an end in itself, it is a condition to enjoy life well! Sign up for the Glow Chef newsletter and receive exclusive content straight to your email inbox!